Why should I choose White Grizzly? No, really, what makes White Grizzly different? Do I really need to have an elevated ability level, and previous powder experience? When should I come for the best skiing? 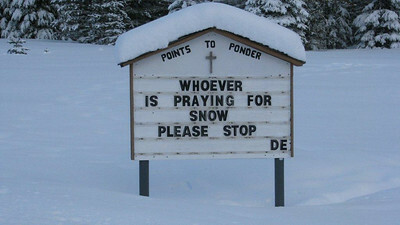 Can I be prevented from skiing due to inclement weather? Are snowboarders welcome at White Grizzly? What is your annual snowfall? What is the winter temperature? What is the lodge and skiing elevation? Do you recommend special equipment? Can I come alone, or do I have to come with a group? Can my group book the lodge for our exclusive use? What is a typical day of cat skiing? What communication services are available at White Grizzly? Do you accept credit cards at the lodge? What should I do if I require a special diet during my stay? Where is Meadow Creek and How do I get there? Can I drive my personal vehicle right to the lodge? Where can I go for a few days of warm-up before I visit? Do you provide alcoholic beverages at the lodge? Because you appreciate quality and attention to detail. White Grizzly offers caring, personal service, varied and challenging terrain, small groups and exclusive packages. You'll come because White Grizzly's extensive, varied terrain is located within BC's premier snow corridor and the powder is legendary. And with a maximum of 12 people per group, you're guaranteed fresh tracks every time. Also, you'll come because you value your safety. All White Grizzly guides are highly experienced and certified, and all White Grizzly guests are provided with top-of-the-line safety equipment and given essential training. 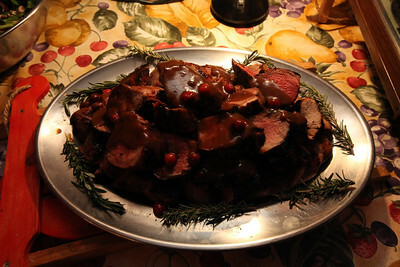 Of course, some people come because they love the rustic cozy lodge, the warm atmosphere, and the gourmet home cooking. And others come for the snowcat's heated luxury passenger cab which is stocked with decadent and nourishing snacks, and where you're served hot beverages in a cup with your name on it. You decide. 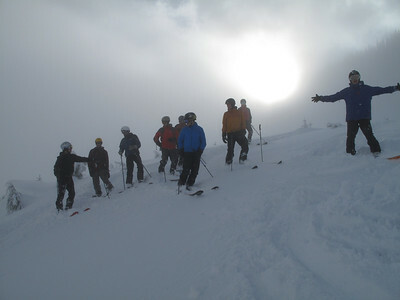 We operate with one group, to a maximum of 12 people, who have the entire use of our lodge and terrain. Our safety record is unblemished, and we provide three professional guides per full group. The runs are Steep (30-45 deg) and Long (2800 feet on average), and have a NE facing aspect which protects the snow from sun and wind. Our guests get lots of vert per day, over 20 000 feet per day at peak season, group permitting. 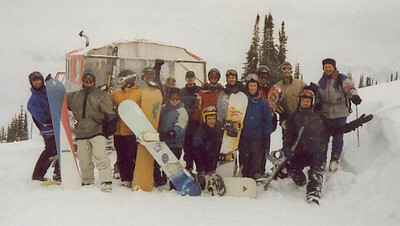 The owners are with the whole gang each day, in the lodge and on the mountain. There are no other shareholders, just a couple who love to rip steep pow. We have super clean and cozy snowcats. There are three cats at the operation, our main passenger cat, another one for back-up, and one especially for building trails. Our hands-on approach and personal involvement means that we have fairly low overhead. As a result, we can maintain reasonable prices which are both competitive for the industry, and give incredible value for the quality of product we offer. Yes, unless you are booking an exclusive package. We specialize in challenging terrain, which is exciting for more advanced skiers and riders, but can pose problems for less experienced people. It is difficult to describe exactly the level of experience you need to fully enjoy our cat-skiing services, but here are a few guidelines. You will be required to ski in control on various types of backcountry terrain, including steep treed runs in powder snow. Most runs of our runs are 30-45 degrees. 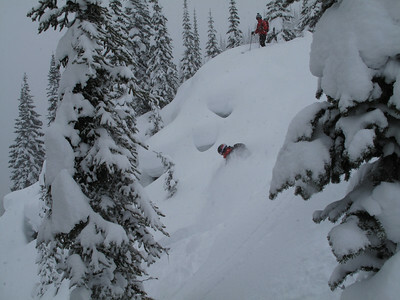 In many North American ski resorts, 35 degrees is labelled 'double black diamond'. If your experience is primarily from downhill resorts, you should enjoy skiing off the groomed trails, on the more difficult runs. With your skis (or snowboard) on, you should be able to make confident parallel turns and be able to side slip, step up sideways, traverse and make kick turns on terrain that has obstacles and is steep. The better your physical condition, the more enjoyment you will get out of your vacation, and the less likely you will be to injure yourself on the slopes. Our guests come from many walks of life, some young and some not-so-young, but share a degree of powder experience. If you are still unsure that your ability and/or fitness level are suited to our operation, please do not hesitate to contact us directly. It really depends on what you want. There is always good skiing here. Meadow Creek exists in a 'microclimate' which means snow here is generally more abundant and drier than to our south. In any case we have numerous well protected north and east facing slopes where we continue to find excellent powder even after the weather becomes sunny and warm. December usually has cooler temperatures, lighter snow and heavy snowfall. The days are shorter, but our prices are a little lower too. January usually has cooler temperatures, lighter snow and intense snowfall. The days are longer, and our prices are a little higher. February and early March typically get "sunny breaks" in between regular snowfalls, and the days continue to get longer. Late March and April generally offer the most sun, if somewhat unpredictable 'dumps'. 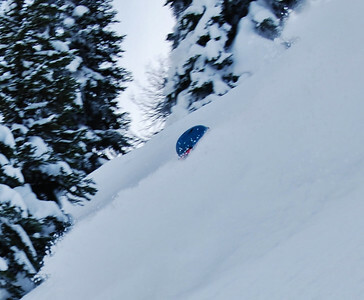 Our prices are lower again, and there is usually still plenty of powder to be found. This being said, the snow comes when it comes. The weather is never totally predictable, we can and do get 12-36 inch 'dumps' of snow over a single night, throughout our operating season, and sometimes it won't snow for days. Good thing we have terrain for days and days. Please note: the weather is outside of our control. In this area we all have to work with what we get. Conditions are such that we get amazing skiing most of the time, unbelievably epic skiing some of the time, and occasional brief periods of good but difficult skiing. No. 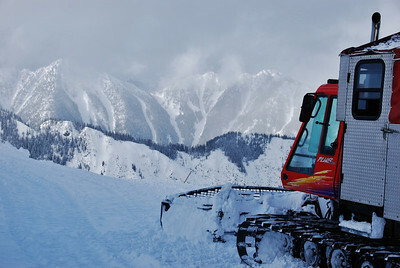 Our snowcat operates perfectly well through heavy snowfall, and we often climb above the cloud layer anyway. Run selection however, may be influenced by some weather conditions, visibility, and the quantity and stability of snow. Yes! Most of our guides are adept at both skiing and snowboarding, so they are attuned to the particular concerns of each discipline (i.e. appropriate line choices, pointing out fun terrain features, and letting riders know when to "point it"). Of course, snowboarders, just like skiers, need to be accomplished and experienced riders, able to handle backcountry conditions, including steep treed terrain. Our guides are wonderful at finding the best fall lines for each group, but on rare occasions, boarders may need to do some traversing or walking. Collapsible poles are not required. We live in a powder-making machine! Typical snowfall in our area is 1,100-1,500 cm (36-50 feet) per winter season. This gives us a snow-pack of 250-350 cm in depth throughout most of the valleys, for most of the season. White Grizzly is located where the moist storms from the Pacific Ocean collide with the cooler Arctic air from northern British Columbia. This results in consistent, deep, dry powder from November to April, and even a few surprises in May. Typical winter temperatures are -5º C to -15º C (23º to 5º Fahrenheit), but in mid-winter they can drop as low as -30º C (22º below Fahrenheit). These lower temperatures are what give us the legendary, super light, dry Kootenay powder. Our on-average lower humidity can make the temperature feel slightly warmer than the same temperatures at higher humidity. The lodge sits at 600 metres (2000 feet) above sea level. White Grizzly runs begin as high as 2,500 metres (8200 feet), with most starting at 2,300 metres (7500 ft). Our lowest pick-up is at 1,200 metres (3,100 feet). Yes. 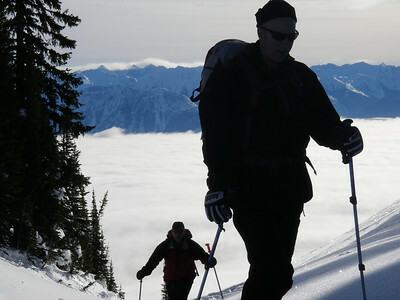 We recommend well ventilated helmets for travel in the backcountry. Goggles should have double lenses and be antifog. An extra pair of goggles is wise, as well as extra gloves or mitts so you always have a dry pair. Clothing should be suitable for variable winter conditions, from snowy cold to sunny warm. This means layering that may be adjusted to suit changing temperatures. The cat is heated, and convertible, so we can moderate for comfort based on exterior conditions. "Fat" skis and free ride or powder boards are advisable, as they provide extra confidence and control. However, please note that while fat skis have made powder skiing more accessible, they can also give some skiers a false sense of their ability. Our style of skiing is not recommended for intermediate or novice skiers and riders. Yes you can come alone, we receive guests in singles or in groups of up to 12 people. 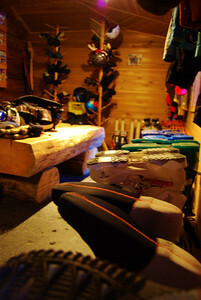 Our lodge never has more than 12 guests, as we only operate one cat per day on the mountain. Rest assured that if you come on your own, or as a part of a small group, you will quickly make friends and feel at home. Since we cater to a specific level of skier you know you will be matched up with people of similar ability, and our lodge has a cozy family-style feel. At White Grizzly you are not just buying a vacation. We maintain an inclusive, friendly atmosphere because we truly enjoy hosting our guests. YES! Many of our bookings are made by groups that make an exclusive group booking. These adventures offer you more than just exclusive access to lodge amenities, snowcat, and mountain. An exclusive booking reserves our entire operation for the sole enjoyment of your party, so the options are virtually unlimited… A few of the things we will gladly tailor to the specifications of your private group are: terrain type and difficulty, group speed, food, and lodge entertainment. For the more ambitious, we can offer cat-assisted backcountry touring, advanced safety training, or special photo-op and video missions. For an example of our more creative adventures, see The ART of Cat Skiing. Please see A Typical Day. The nearest cell phone reception area is a 30 minute drive from our lodge. We like to think that your winter adventure vacation is a great opportunity to “disconnect” from the world. Guests can call out on the guest phone using a calling card or a credit card. You can accept incoming calls at (250)366-4300. Messages (250)366-4306 can be left on the Lodge business line. We ask that you limit the length of your calls as a courtesy to others guests. We are also pleased to provide high-speed internet and WiFi throughout the Lodge. Please remember to be discreet with your usage, since others around you may find your connection an intrusion to their vacation. Please see our Lodge section for details. Yes. We are able to accept MasterCard and VISA as well as cash, cheque, bank draft and electronic bank transfers for any payments at the lodge. Please see our section on Payments for further information, or contact us directly. Following the Canadian custom, we are happy to accept gratuities; however, they are completely discretionary. Should you wish to show your appreciation in this way, funds can be given to a general gratuity pool or you may give them directly to the individual. Tips are usually calculated at 15% of your package price ($80-$100 per person per day) for the general pool, which includes the Lodge Team, Cat Operators, and Guides. Massage therapists are separate from the general pool. Guests should be aware that there is no cash withdrawal available at the lodge. We are happy to accommodate special dietary requirements. However, as our meals are planned in advance, and we live some distance from the nearest grocery store, we ask you to please inform us in advance of your dietary restrictions. There is a space reserved for this purpose on our Reservation Form, which you complete at the time of booking. All meals, starting with dinner the first night you arrive, are included in your package, and our renowned Culinary Team is experienced with a variety of special requirements. We encourage you to contact us to discuss your particular needs, if you have any doubts. We are not in the middle of nowhere, but you can see it from here! Please see our section on Travel and remember to allow extra travel time as winter conditions can cause delays. Yes, you can. We recommend good winter tires, and STRONGLY recommend 4x4 wheel drive vehicles only. 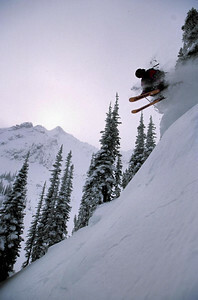 There are many excellent ski resorts en route to our area. Depending on your route, you may wish to visit Revelstoke Mountain Resort in Revelstoke, Kicking Horse in Golden, Fernie Alpine Resort in Fernie, Whitewater in Nelson, Red Resort in Rossland, and/or Schweitzer in Sandpoint, to name a few. There are also a number of cat and heli operations in the area which offer mellower terrain - perfect for warming up to your White Grizzly adventure! We STRONGLY recommend that you purchase trip cancellation, trip interruption and/or emergency evacuation insurance, as there are many variables involved with winter travel, and backcountry adventure. We also encourage that all guests purchase travel or accident insurance. Your insurance broker, travel agent or even credit card company may be able to advise you about what other types of personal insurance you may wish to purchase, such as disability insurance and life insurance. We have some wine available for purchase on the premises, however our selection of beer and spirits is limited. If you have preferences, we encourage you to stop on your way to the lodge and stock-up on supplies for your stay. We can assist you with wine pairing if you desire. As always, our team will make every effort to accommodate your needs.